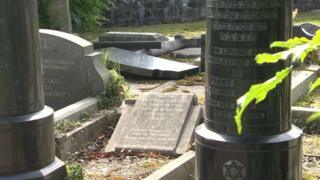 Thirteen Jewish graves have been damaged in an attack at Belfast City Cemetery. Police were called to the graveyard shortly after 15:00 BST on Friday. Some of the graves date back to the 1870s and are in a walled off section of the cemetery, which is often locked. Ch Insp Norman Haslett said it was "a particularly sickening incident, which we are treating as a hate crime". "To disturb the sanctity of a cemetery in this way is completely unacceptable and I can assure the public that we will conduct a robust investigation," he said. Alliance Party Councillor Michael Long said it appeared to have been a targeted and systematic attack. "I would have great concerns about the thoughts of the people who have been involved in this," he said. 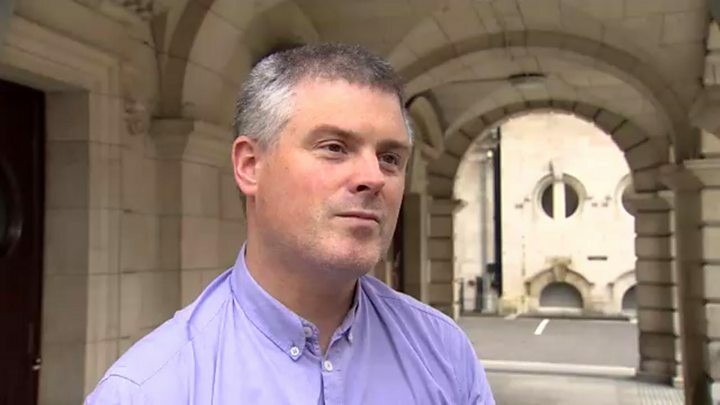 William Humphrey from the Democratic Unionist Party (DUP) said he was "disgusted and appalled". "I understand that council staff reported that eight youths, supported by a larger crowd, caused the damage, using hammers and blocks," he said. "A graveyard is a sacred place and should be respected as such," Mr Humphrey added. The North Belfast MLA said he has been in contact with the Rabbi and members of the Jewish community to express his revulsion. West Belfast MP Paul Maskey also condemned the incident. "Visiting cemeteries can bring great comfort to grieving relatives and friends and it it would be very distressing for anyone to have the grave of a loved one desecrated in this way," he said. The municipal cemetery on the Falls Road in the west of the city, is one of the oldest public graveyards in Belfast. It is maintained by Belfast City Council.